Jean-Paul Sartre was a French philosopher, playwright, political activist and novelist, living in Paris in the 1920’s. He was particularly famous for his theories and beliefs about existentialism. In the 1920’s, when religion was much more dominant in peoples lives, Sartre’s theories on free will were more astonishing than they would be now, as they were from an atheists perspective. Existentialism believes that we were born to make our own path and do not have a pre determined destiny based on fate. We create our own goals, needs, wants and destiny, and we fulfil our own dreams. We are not a pawn in the game of life, or controlled by a higher force, life isn’t controlling us, we are controlling it. It is the individual that makes the life, not the life that makes the individual. 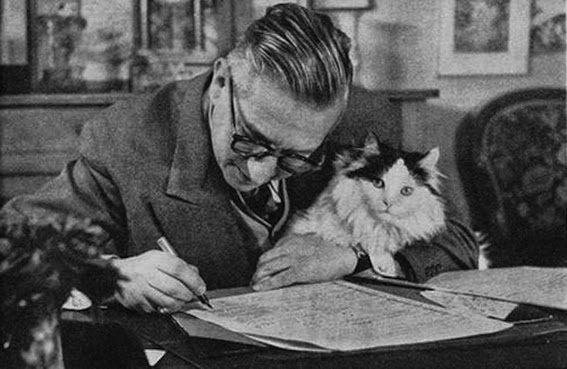 During WWII Sartre was captured by the Germans and was a prisoner of war for nine months. He was quoted as saying: I do not believe in God; his existence has been disproved by Science. But in the concentration camp, I learned to believe in men. On a lighter note, Sartre was famous for saying Hell, is other people. He wrote a play called No Exit, about three people stuck in a room which they soon realise is Hell. Awaiting some kind of torturer, they eventually find out that the torture is their interaction with one another, and that they can’t bear each other, and there is no way out! He was awarded the 1964 Nobel Prize in Literature, but refused to accept it. His first major work was called Being and Nothingness – His cat was called ‘Nothing’. He was interested in seducing beautiful women, and was widely known for his drug use. His use of one particular drug famously left him thinking he was being chased by a lobster!